It’s another short post this week as we continue to work on PHW’s 50th Anniversary Celebration (spots are still available!). 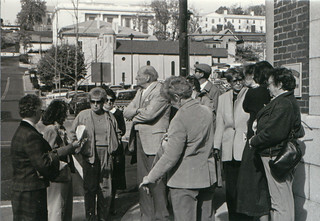 This special two-part tour and lecture focusing on Staunton was coordinated in 1988 by Katie Rockwood and Kay Whitworth. The first phase, a lecture, was held in the Old Stone Church on East Piccadilly Street in Winchester. Ann McCleary, Curator at the then newly opened Museum of Frontier American Culture, spoke on the early 18th and 19th century architecture of the Shenandoah Valley, and how the Frontier Museum interprets the lives of the early pioneers. The second phase was the field trip to Staunton. The first stop on the bus trip was the Frontier Museum itself. At that time, two homesteads were completed – the Scotch-Irish and the Appalachian farm. PHW’s guests were offered a special guided tour on this trip, as normally experiencing the site was unguided. The tour group had a private tour and lunch at Belle Grae Inn, which at the time was a gourmet hotspot in an 1870s Italianate home converted to a bed and breakfast establishment. After lunch, the group meet with representatives from the Historic Staunton Foundation for a walking tour of the downtown, with an emphasis on how their Facade Improvement Program impacted both the appearance and economic vitality of their downtown. Some of the highlighted spots included Trinity Church, Stuart House, C.W. Miller House, and The Oaks. Relive the field trip to Staunton at the Flickr album. Next Next post: PHW Newsletter Online Now!